According to Model Roundup, Revell will start shipping kits again in September with the Frank Iaconio 84 Pro Stock Camaro as part of a very limited early shipping release. That is good news, hope it's not just a rumor. I believe the news about Revell resuming kit prodution has a considerable degree of credibility. Some sources have published a list of planned Revell releases from September through December 2018. One of those releases on the list is an all-new kit that Revell had been working on prior to the Hobbico bankruptcy, of a subject that had not been discussed in the public domain (that I know of), even as a rumor. That kit is listed as a 1968 Chevelle. The fact that this new kit, which is a full detail SS 396 hardtop, has now appeared as part of this published list makes me want to think the entire subject of Revell resuming production is very credible and of course, very welcome news. Time will tell, of course, but for the first time since the Hobbico Bankruptcy was announced, I am now cautiously optimistic about the future of Revell in America. Tim, this is indeed encouraging as it indicates at the least somewhat of a resumption of what got interrupted by the bankruptcy. The silence of New Revell (as I call the merged entities of Revell USA and Revell Germany) since late Spring has fueled much speculation but little in the way of fact. This, at least, is a beginning. What was unique about Revell USA before its demise was that it was very active in creating and marketing new subjects. Revell USA product had a uniquely American character, both in its restored and reissued back catalog and in its new subjects. With the new ownership being German and the German half continuing operations since the purchase with little interruption or change in character, many of us have grown concerned about the nature of what remains of the former Revell USA with the liquidation of its physical plant and dismissal of its staff last Spring. So far New Revell is said to have established a "Sales Office" in the Chicago area to resume sales and distribution. Now comes, for modelers of "USA style" auto subjects at least, the "acid test". Once sales distribution resumes New Revell will have several choices as to how to guide the legacy of its Revell USA acquisition. In the worst case, something I doubt will happen since the Revell USA assets are so valuable and were acquired so cheaply, the new owners will clean out the pipeline of pre-bankruptcy projects already in various forms of production and allow the rump of Revell USA to fade away, perhaps selling its assets off at a later date. More likely is a Round2-style operation where the old catalog of molds is maintained and remarketed but no new projects created. In this case Revell USA as we knew it will have disappeared. The third option, the resumption of creative activities and the creation of new subjects, would require far more in the way of resources and expense, especially now that Revell USA has been shut down. And it could come in a couple of "flavors". The simpler approach would be to source new subjects from the European cultural center with its emphasis on a far broader range of model subjects including naval, military and aicraft subjects and, in the automotive realm, focusing on traditional European classic cars, sports cars, and contemprary subjects. A revival of the USA-style Revell tradition would most likely require a a far greater degree of re-staffing and rebuilding of a team with expertise in this realm, in my opinion, the European team having shown little evidence of any engagement in this area. Thanks for the update Tim, I'll take two of the Chevelles,lol. OH NO NOT ANOTHER BORING RACECAR? WHERE'S THE POLICE VECHILES OR LIGHT COMMERCIAL TRUCKS..OH WELL LET'S TRY TO LEARN THIS 3D PRINTING. Gotta love this attitude. Just because you find it boring doesn't mean all do, and no, I have no interest in it either. I am just happy Revell is on the comeback. 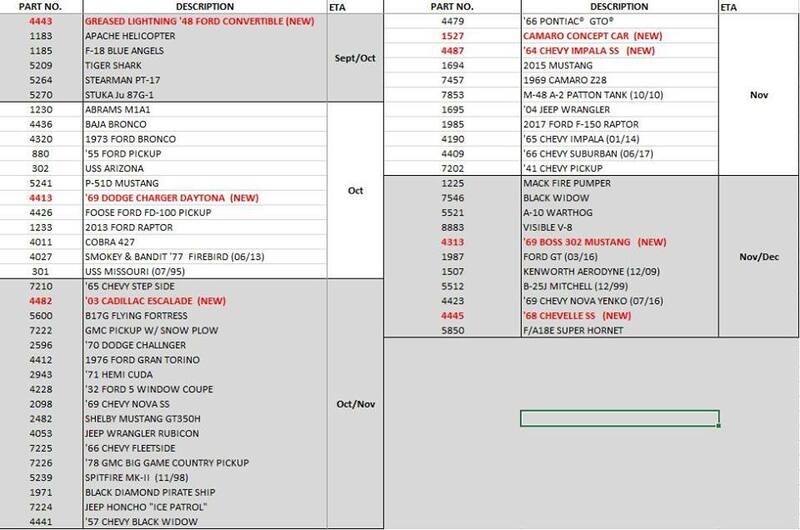 I am very pumped for the 68 Chevelle if it is true. Let's be happy they are returning. Looking forward to Revell returning. We all need all the sources available for new kits! Great news, I wait with abated breath. www.revell.com is still down though. Everything will be running through Revell of Germany for the time being. "That's Spenser with an 'S' like the poet." Interesting times ahead! Good to see Revell survive anyway under the German ownership. I can understand American auto modellers wanting US subjects, but the global market has changed over the years and this is reflected in the subject material in newer kits to get a return and be viable. Also, new auto kits from Germany are generally 1/24th scale, whereas the US Revell produced in 1/25th. Let us not forget that Revell survives on many other kit genres, aircraft, military, ships, science fiction etc. Over on mcm is a thread about fall releases from Revell, which include american subjects, some reissues, and, get ready for it, sit down.... a new tool 68 Chevelle SS. I can only hope the '68 to be 2 in 1 if not even 3 in 1 kit. One version should naturally have blown engine and jacked up 4x4 driveline for those trendy apocalyptic backroads. Crisp new highly detailed 396 engine and decals would be great. TIM Thats great news i love the 68 i had one in the 60's till i rappeted around a light pole one night i would love to build a couple of them i would also like to see them do a 68 442 thats a great one from the 60's also. Thanks Tim for expanding upon the news of Revell shipping kits again in September. I didn't even know there was going to be an all new 68 Chevelle kit in the mix. This kind of gives me hope that will see a full detail kit of the '16 Shelby GT350R. According to Revell GmbH … the only new automotive tooling scheduled for 2018 … is for a Porsche 356 Cabriolet in 1/16th scale. This Level 4 kit is scheduled to be released in November 2018 with an assigned Product Number: 07043. This large scale effort compliments their 1/16th scale VW Kafer and VW Kastenwagen. Obviously, the 1968 Chevelle is “the talk of the town” … but has the General Motors Corporation/Chevrolet Division issued a license for Bunde, Germany-based Revell GmbH to produce the vehicle in hobby kit form? Obviously, the 1968 Chevelle is “the talk of the town” … but has the General Motors Corporation/Chevrolet Division issued a license for Bunde, Germany-based Revell GmbH to produce the vehicle in hobby kit form? According to the thread that is on MCM, it will be kit #4445 and is expected in November/ December. My guess is that they would obviously have the licensing in place. It was most likely gotten some time ago. Revell did a very good job of keeping this under wraps. Thanks for the info … I don’t build factory stock, but I definitely would like to build a ’68 Chevelle in Pro Mod (twin turbo) configuration. I can understand American modellers waxing lyrical about the new Chevelle kit as it fills a gap. Personally, I wish that Revell would produce a 1/24 scale kit of the Bugatti Veyron but I guess that perhaps the licencing may be prohibitive? No manufacturer has made a kit of this car. It is the sort of thing that Tamiya, Hasegawa or Gunze may have gone for. There are diecasts out there but no kits! Also it is about time Revell re tooled that tired old Jaguar E Type kit that they have kept re issuing since the 1960's. Not at all. I love the Canadian versions of Chevy products. Let's just be happy that they are coming back at all if that is the case. We can all resume speculating and complaining about what kits will be released & how accurate they are when they start hitting the shelves again. Atlantis Toy & Hobby has bought the existing tooling from Revell of Germany stored at Elk Grove, Il.